One of the downsides to living in an NYC apartment is that space is a extremely valuable commodity. As a result, the number of “things that are used to make only one type of thing” I can have is limited. I already have a madeleine pan, a petit four pan, numerous cupcake tins, mini-springform pans, and a recently-acquired slow-cooker. I just got rid of my juicer. So I really have no excuse to buy a popover pan. 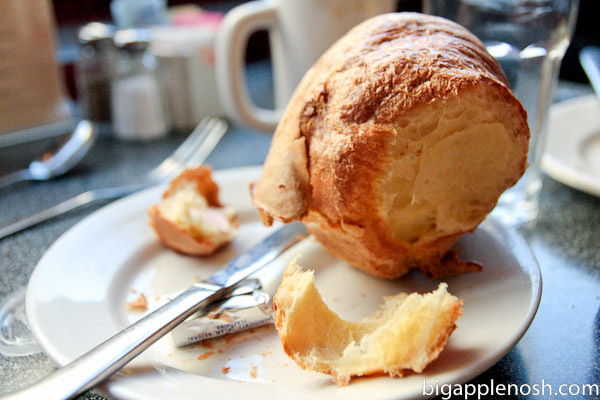 That just means I’ll have to get my popover fix outside of the kitchen – and what better place than Popover Cafe? Yes, it’s a whole cafe dedicated to popovers. While I popped in (OMG! Haha. Unintentional) for Sunday brunch, they are open every day for breakfast, lunch and dinner. 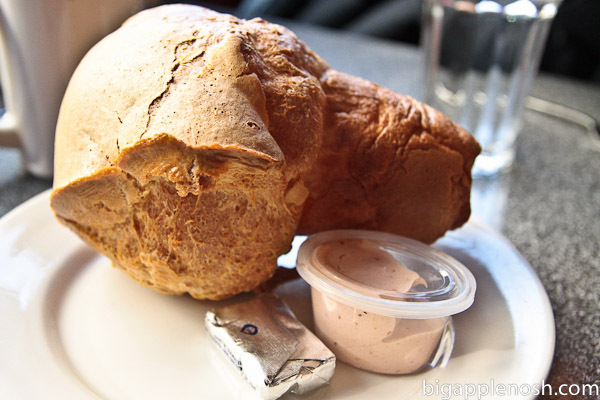 After perusing the menu and ordering, I was greeted with ….THE POPOVER. For the uninitiated, the popover is an eggy, fluffy pastry that “pops over” its tin while baking, thus earning its name. Popover Cafe serves its namesake pastry with a healthy portion of strawberry butter (AND regular butter, yum). The result is light, buttery goodness. I’m a sucker for cheddar grits, and these didn’t disappoint – salty, tangy and gooey. 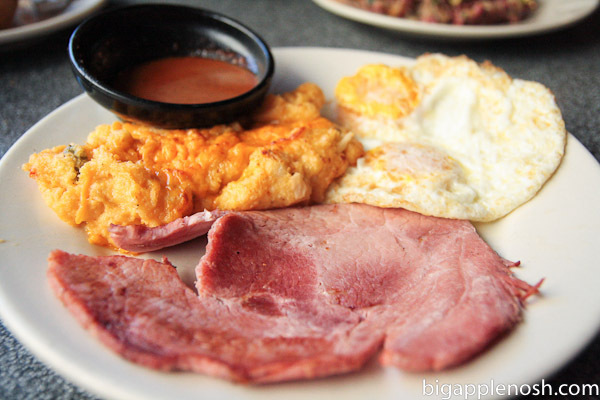 The ham was hearty and the red-eye gravy was perfect for some enthusiastic egg-dipping. 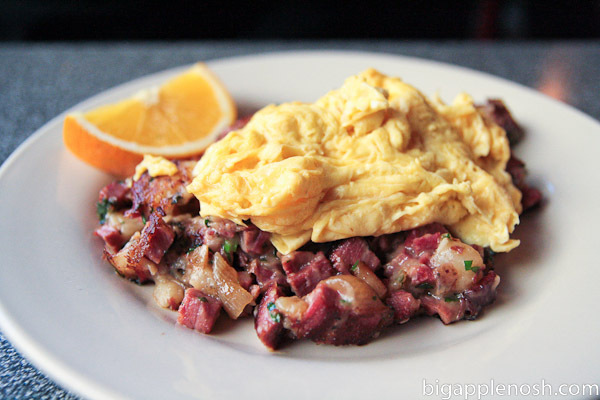 I’ll freely admit – my experience with hash of the corned beef variety is limited to the run-of-the-mill, small-diced potato variety. And I like it. So it took me a few bites (of my buddy’s dish) to convince myself I liked this hash. But when I did, I was convinced. It was fatty, flavorful and nicely seasoned. 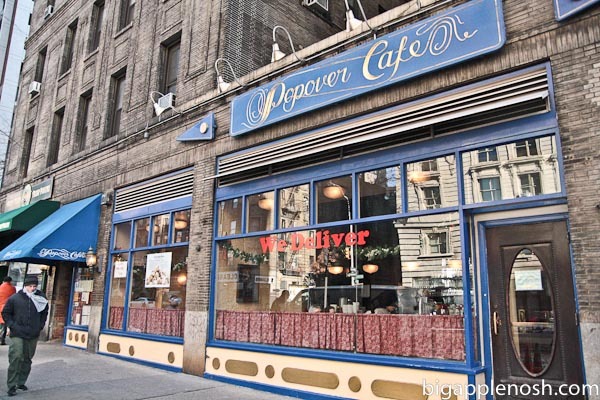 Popover Cafe has been an institution of the UWS for decades now, and a sample of its light, fluffy pastries will explain why. If you’re ever in the area, pop on in! (Sorry, couldn’t resist). Go for the popovers, stay for the brunch. You made my mouth water..looks so good! Really awesome review! so pillowy. and the grits sound delicious! Mmm, I love popovers! The texture is like nothing else! I've never had a popover but it looks amazing. Like a big airy ball of delicious. Yum!! THe cheesy grits look so good! The pop-overs sound like a fun food to eat! 🙂 Looks like an interesting place to be! Oh man, I am insanely jealous…I want to try a popover! Yum. And I totally know how you feel about not having room for specialty pans – we have little to no space in our current kitchen, so I have to stick with the basics only for the time being. But oh, how I dream of the different appliances, pots, and pants I will accumulate as soon as space is not an issue! I love popovers! They served them at Tyler Florence's Wayfare Tavern and they are so delicious – lighter than air. Yum!